My mom always said you either have time or money but rarely both. 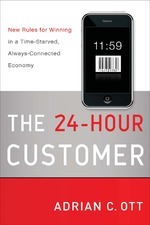 Silicon Valley advisor and Fast Company contributor, AdrianOtt’s award-winning book, The 24-Hour Customer, gets right to this point. Time has become more important than money. Time is finite, money isn’t (though it may seem like it a times). When we make a decision about a product or service, we are really evaluating our time versus our cost, not just the price. We evaluate where we have to go, what else we need to do and when we have to do it. We may compromise what we want if it’s on our way to where we’re going – because it’s just easier. For companies today, getting a share of customers’ time is harder than getting share of their wallet. Adrian eloquently points out that since no one is making any more time, it’s value continues to greatly increase. We are witnessing a major shift in customer buying behavior and needs: from the Time Value of Money to the Money Value of Time. The companies that understand and capitalize on this shift will bring tremendous value to their customers, and in turn themselves. Adrian’s knowledge of customers’ perception of time and its implication for buying behaviors is grounded in experience, observation, empirical studies and neuroscience. Traditional companies tend to view products and services as the basis of competition and a task as a discrete event. Innovative companies view customer activity as the basis of competition and a task in the context of all the tasks that customer has to do before, during and afterwards. This is a significant competitive shift – from tangibles to intangibles –Time. Remember, you are competing for customers’ “X” minutes of activity – what else could they do? who else could they hire, instead of you? Adrian’s Time-ographics Framework is a great tool to assess how customers allocate their time and attention among a variety of products and services. Throughout the book, Adrian provides tools, examples, and situations to help you understand your customers’ needs, constraints, and frustrations around Time. She elaborates on the motivations and the role of habits, which are very hard to break, which drive customers’ time and attention and how to create solutions based on those. Sometimes, the status quo, the path of least resistance while maybe not better, is faster. Key to learning about your customers is their willingness to share their information with you. Take for example Nike+. The Nike+ service changed the customer relationship from transactional and periodic to an ongoing, integrated relationship with the runner creating an online running community that shares their health and run statistics. In addition to sharing the factors that go into buying decisions based on customers’ value of time, Adrian provides experientially based wisdom on how companies can leverage these factors and build organizational wisdom and competency around them. Since behaviors shift over time, over product or service use and with emerging technologies and markets, the model Adrian provides is dynamic, allowing companies to continually adapt to the emerging customer needs, and wants. At the end, Adrian sums up the entire challenge of servicing 24-hour customers with one word: Trust. In order to continue to help customers’ do the jobs they want done in a time-effective and efficient manner, customers need to trust that companies have their best interests, including privacy and security, in mind. So many aspects of our 20th Century world are changing. How customers decide what, where, and when to buy is one of the most significant in our market economy. Adrian’s book helps you think about this new world in ways you haven’t considered. If you have, the book provides tools and methods to create solutions that matter and competencies that can be sustained.